After all this time, why haven't the mainstream heroes taken a more proactive stance against their enemies? 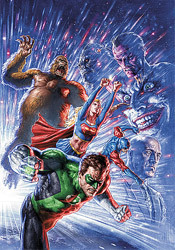 That's the question posed, more or less, at precisely the same time around the planet by the Green Lantern, Green Arrow, Supergirl, the Atom, Shazam, Congorilla and Starman. United by a terrible sense of personal loss and motivated by a shared yearning for justice, this unlikely group of heroes seems destined to meet up sooner than later. The real question isn't how far they're willing to go, but rather how their actions will be perceived by their more straight-laced former teammates. James Robinson's take on Hal Jordan is about as solid as they come. When the Green Lantern stands before DC's big guns and asks what the “Justice” in Justice League stands for, it's more than just a rhetorical question. As he observes the changes their enemies have made over the years, notes the terrible losses they've suffered and bemoans the super group's stagnation, it becomes clear that none of the other leaguers have an answer for him. Robinson delivers a Green Lantern that's stern, but not without reason. He nails the close friendship shared by Hal and the Green Arrow, although the two only share a few brief pages together. Just about any time there's an emerald-themed hero on the page, in fact, you're in for a treat. That statement doesn't always hold true when the book turns its focus to the other protagonists. While the writer's rendition of the past and present Atoms (Ryan Choi and Ray Palmer) is equally effortless, I can't say the same for Starman or Congorilla. The same level of care and personal investment that Robinson delivers to the better-known heroes isn't afforded to their associates, which is odd because the writer actually cut his teeth on Starman years ago. Either way, this results in a plot that starts out exceptionally well and slowly fizzles away over the course of its final pages. Mauro Cascioli's blend of traditional pen and ink with vivid, picturesque painted colors is also initially impressive, but eventually overstays its welcome. When Cascioli gets a powerful scene to really dig his teeth into, as he does more than once in this issue, his work is dazzling. The shot of Ollie and Hal levitating away from a tongue-tied Justice League is some fantastic work. It's the moments in between – the meat of Hal's speech to his teammates, the unsettling quiet in the Congo after a massacre – that don't seem suitable to such precise detail, such intense visual scrutiny. That makes for an issue full of tense, postured, constantly flexing characters, even when the situation is wholly inappropriate for that kind of pose. Does it look good? Frequently, yes. I'm a big fan of painted sequential artwork when it's done well, and on a few occasions I'd absolutely use that phrase to describe Cascioli's work in Cry for Justice #1. But I also believe that painted visuals can be just as much a detriment to the story if handled irresponsibly. And, more often than not, that's the case here. Is Superman always clenching his stomach to show off his perfect abs? Even when one of his oldest, dearest friends is threatening to walk away? This issue's artwork largely plays out like a series of sparsely related pin-ups, rather than a single cohesive piece. The continuous word balloons may be enough to tie it all together, but that shouldn't be their concern. While I get that the one thing unifying these heroes is their shared, renewed sense of purpose, by the end of the issue things begin to seem a bit redundant. Yes, they've each suffered a loss, understood. They each seek justice, okay, also understood. Did they all really need to take the time to shout the word at the top of their lungs, even if it made no sense in the context of their conversation? JUSTICE! Yes, that's fine, I see it's the title of the mini-series… but damn, could it have been any cornier? Ultimately, my opinion of this issue is split. When it's focused and relevant, it's genuinely moving. Hal's scolding of his JLA teammates makes for some fantastic reading, and then ends with a conundrum with no easy solution. Pity it isn't always that driven, and when the writing begins to slump, the artwork follows suit. Flip through it and pay close attention to the first half-dozen pages. It's downhill from there.